You can imagine how fun it is to design a new collection of floral arrangements. We love each design that we make, but as each new season approaches we get excited about the return of our favorites stems. The aniticpation keeps our work very fresh, and ultimately, very rewarding. We choose flowers that grow naturally in our gardens and fields to create that Northern Virginia feel. This summer, we will work with Roses, Peonies, Sunflowers, Ranunculus and Delphinium in warm tones and frame them with Queen Anne’s Lace, Amaranthus and seasonal greeneries like Pittosporum and Geranium Leaf. We always stay true to our signature style with low, lush modern designs that have an "airy" feel. The legginess and space between flowers helps us to achieve the "gathered" look so popular in floral design while creating focal points for our favorite stems. Sunflowers always present the opportunity to create height and you'll see that in our "Field" arrangement and traditional Rose arrangements. 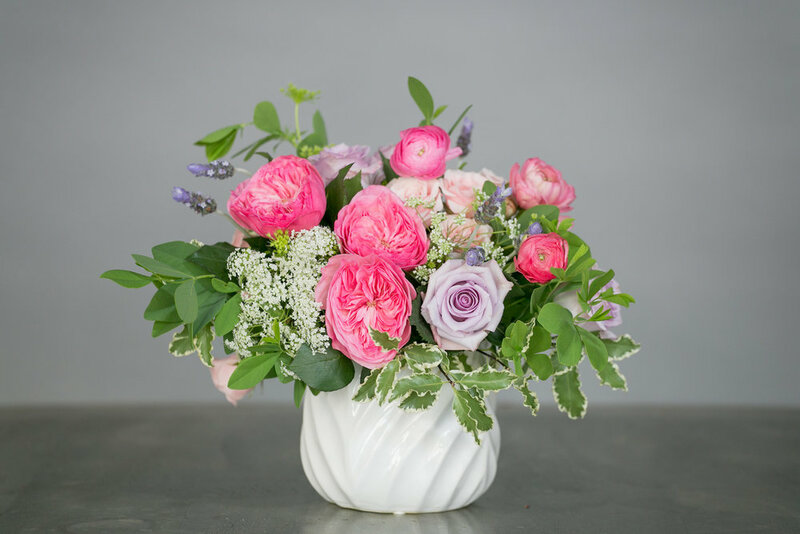 The team continues to work with new vase styles because we think it's important to send flowers in a container that can be used again and again. This Summer we’ve added two vanguard designs that include some of the industries most luxurious flowers. Summer's Eve (shown above) inlcudes white Phaleonopsis Orchids. No ordinary flower, Phaleonopsis Orchids add a decadence to the design that will take your breath away. The gorgeous marbled blue vase reminds me of our gorgeous Northern Virginia summer sunsets. You may recall that last year, Pantone chose two colors, Rose Quartz and Serenity, as the colors of the year. 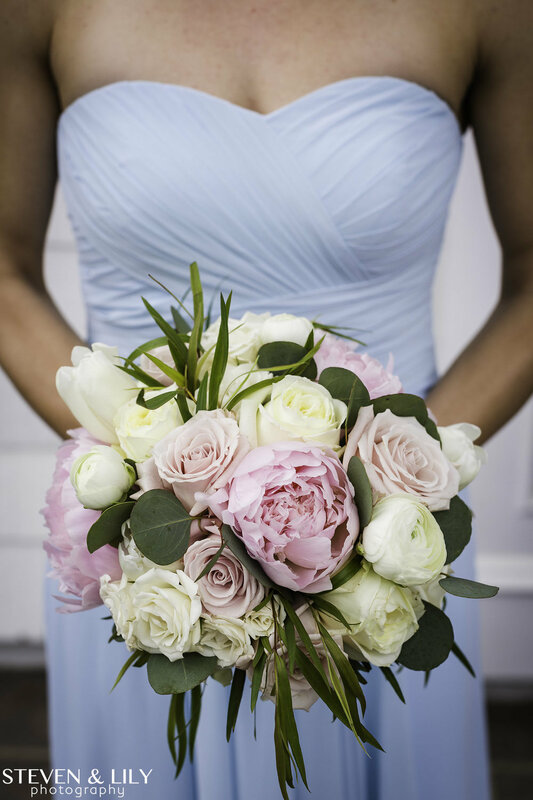 We have already helped several brides create that combination this Spring. In Summer's Eve, we've changed the color duo a little by combining lavender with pale blue. Lavender and puprle are very trendy colors for wedding flowers this year. We'll give you a peak at some of the beautiful lavender and purples weddings we have done so far this year in the next couple of weeks. Orchard is named for the colorful fruits that we gather in local orchards throughout the East Coast. 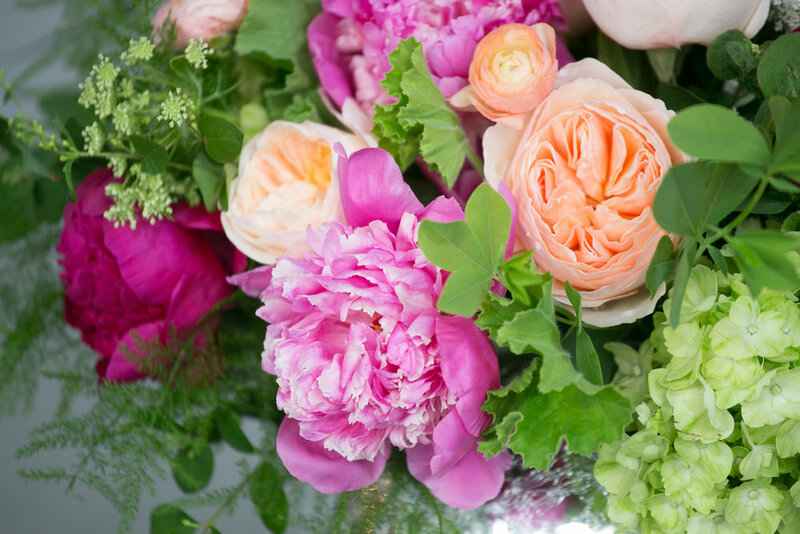 Two colors of pink/red Peonies, peach Juliet Garden Roses and Ranunculus, and verdant greens combine in this colorful array. The vase is a new style that we introduced for Spring. It's a Crackle Glass Sphere that adds glamour to this unique design. The colors are perfect for a party or an event, or to brighten a home or office. Each of the designs for summer are full of color. Picnic features Sunflowers and peach Roses, a gorgeous color duo. Very Berry includes hot pink Garden Roses, Ocean Song (lavender) Roses and Pink Spray Roses. Gathered is the softer side of summer with pastels in an elegant airy style. Countryside is the most modern design with it's assymetrical look, loose and airy on one side blending to fuller florals in an "ombre" arrangement of colors. Take a look at the Summer Collection and let us know what you think. Interested in creating your own design? Call and speak to our Front Desk Concierge about a designer's choice arrangement with your favorite florals.